How do I know if someone saw my Instagram video? If you’re asking to know if someone will know that you saw their video, don’t worry much – yet. This is pretty simple, there are 3 options. You uploaded a video and want to check views there. Well, this isn’t exactly possible but you can tell who saw it for sure by checking who liked the video. Here’s what counts as a view though: If a viewer clicks on your video to enable sound (it’s autoplayed with the sound off) or watches more than 3 seconds of the video (or 5% minimum of a 60-second video) then this will count as a view. You can see the views below the videos. By clicking on the number of views below the video, you’ll be redirected to the second part of the image which shows you how many likes the video has and who liked it. When you add a new video Story to your profile, you can see who viewed this video directly as soon as it’s opened. No matter how long each user was watching your Story (a second or the whole Story, which is 15-sec), you will see him on the list. To check that simply open your Story and swipe up to see both the full list and basic stats for it. If you’d like like to analyze all your Stories from a selected time period it may be, however, hard to be done only within Instagram. 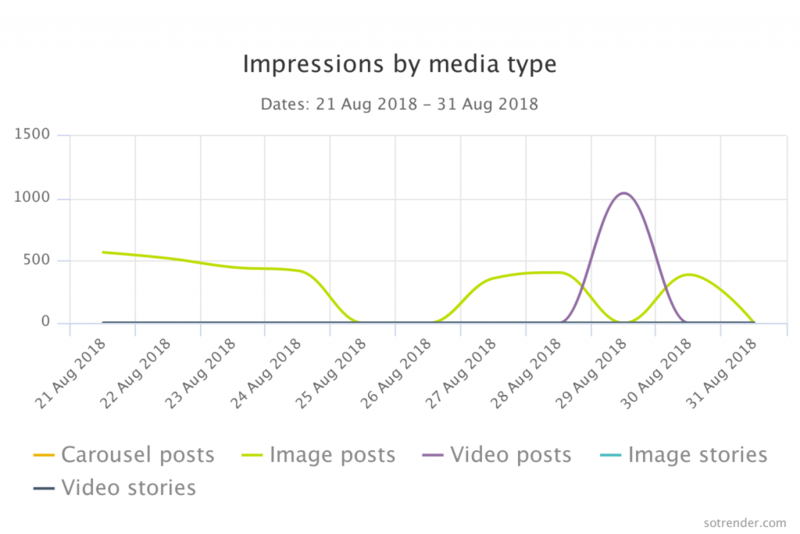 To do so, we’d recommend using external social media analytical apps, where you can easily monitor any number of Stories in a longer perspective. Especially interesting is how users who have seen a video Story are ranked on the list. Just after information who saw your Story, it’s also worth to know that users who interact with you and the content you post in general are ranked on the top of the list. Sometimes the results may be obvious but in some cases, you can find out if you, or your brand, have some “stalkers”. Once you shared or sent someone a story as a direct message (DM), you can see if this person has viewed your message or not. This doesn’t, however, necessarily mean that they opened the video you sent. They may react to your DM with a reaction or even reply to it but it still does not mean they have seen the video you had sent. Why is it all the only knowledge users may have when it comes to video viewers? Unfortunately, currently Instagram API doesn’t provide information such as users who have exactly seen your video posts or anything like Community Ranking, which is available for Facebook. Even on YouTube, for example, you can’t know who exactly saw your video but shows you more broad analytics as well of those such as likes, comments, and replies. But let’s face the truth, who saw your video isn’t the most valuable piece of knowledge. An exception may be when you want to know if your ex is visiting your profile and watching your posts 😉 But in general, we rather want to know how our videos are performing over time. To analyze that the best option is to use social media analytical tools. Like for example Sotrender. 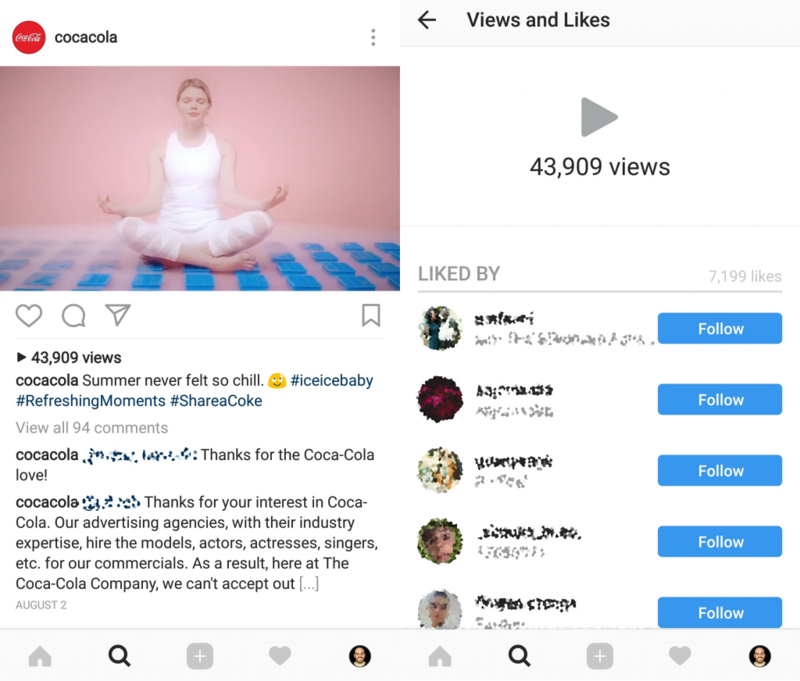 If you’d eventually like to get a broader picture on how your videos, and content in general, on Instagram performed, you can do it with Sotrender. Impressions divided by media type. 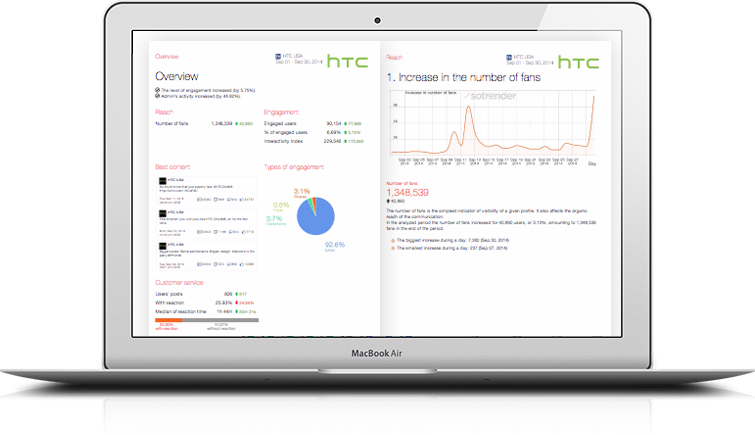 Monitor how many impressions each piece of content generated on a selected day. It’s especially interesting when you run a seasonal campaign or any type of ads on Instagram. Impressions can be also analyzed with the pie chart. 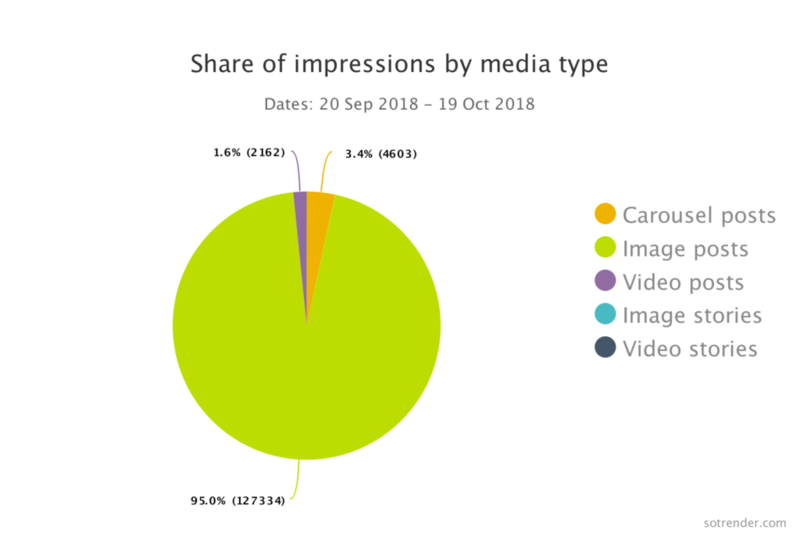 This visualization provides with a bigger picture of how impressions are shared by each media type in a selected time period. This will help you understand how popular are videos comparing to other types of content. Compare and analyze whether video content generated more impressions than another type of content. If the answer is yes, invest more time, effort and other resources in creating and posting videos. Is your audience more willing to engage with your video content rather than carousel or image posts? It will be another sign in which direction you should plan your next activities. You can also compare if your audience has similar preferences on other social media channels you run, for example on Facebook. This is why comprehensive social media analysis is so important. Finally, analyze each and every video post separately to understand how users are reacting to them and which ones are performing the best. how many times was it saved by other users. Especially interesting is data about how many times users saved your video posts. Once they save them a lot it means not only that you are getting many Instagram video views but, what is even more important, these videos are especially valuable for your audience. It’s a clear sign you should focus on similar ones more often. Using social media analytical apps is very beneficial for any social media marketer. Such tools offer not only data presented above but much more insights about your audience (followers), content (posts) and overall performance of each account. They usually have also some additional features, like optimization or reporting.